Bead Size 15-18 mm diameter. Please see image with penny for size comparison. Additional information: "King Beads" are wonderful old Venetian wound and marvered bicone beads. 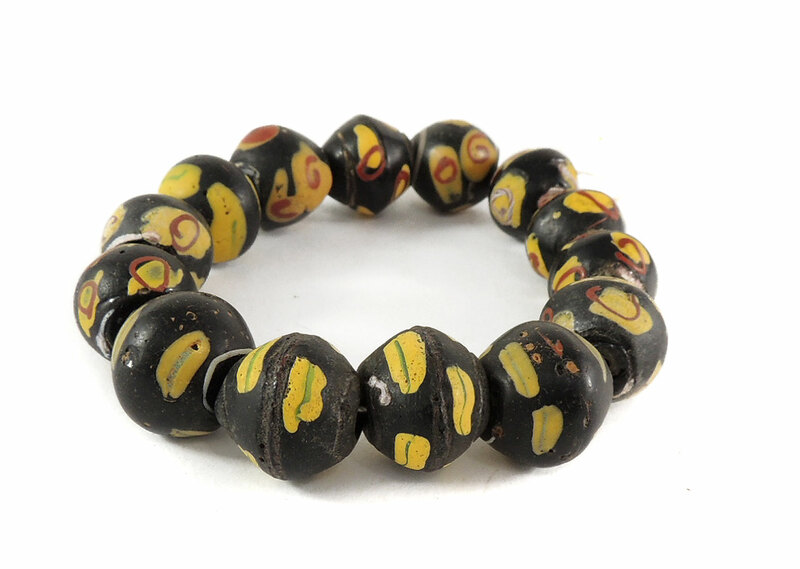 Sometime in the past, probably in the heyday of the import of African Trade beads in the early 1970s, these were given the name of "King" beads. The legend has it that these were worn by African "Kings"(Chiefs). "King" beads come in a large variety of colors, trailing designs and sizes but always in a bicone shape. 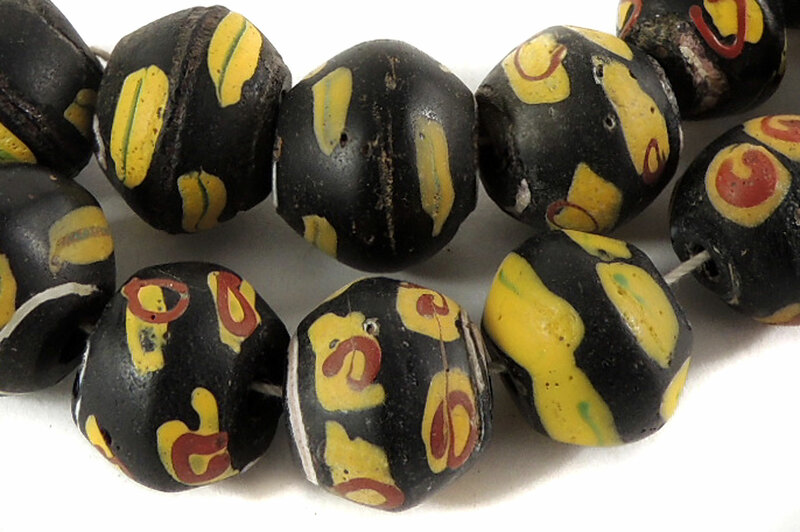 The earliest versions of these beads can be dated back to the mid 1800s and represented on Moses Lewin Levin bead sample cards which were donated to the British Museum in 1865. (See THE HISTORY OF BEADS (Dubin)). These old Venetian "King" beads were made up to the 1920s and later versions are represented on Sick and Co. bead sample cards from this period. 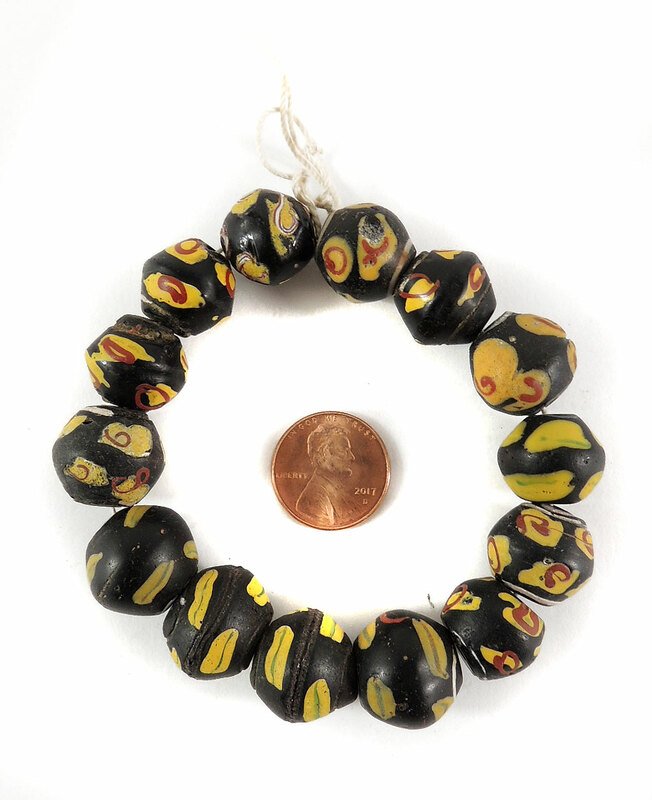 Still revered in Africa today, these old beads are on prominent display in Dipo Intiation ceremonies in Ghana, where the yellow forms , in particular, represent maturity and prosperity (See AFRICAN CEREMONIES (Beckwith/Fisher)) . This would explain the popularity of the yellow striped "King" beads. "King" beads are highly collectable and there are some spectacular private collections of these beads in America, Africa, Japan and Europe.To see some rare and fabulous examples of these old Venetian bicone beads see VOLUME IV, RUSSIAN BLUES, FACETED AND FANCY BEADS FROM THE WEST AFRICAN TRADE (Picard).